We couldn't be more excited to show off this picture - it truly is our favorite gift of the holiday season. This year, Downtown Decorations, Inc. donated a giant 6ft lit and decorated wreath alongside other decorations to the men and women of the 908th Expeditionary Force of the US Air Force. 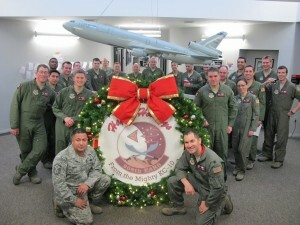 The wreath was shipped to Fort Bragg, CA and then went directly to the base in Afghanistan. Thank you to all of our men and women in uniform that are allowing all of us to celebrate a safe and joyous holiday.